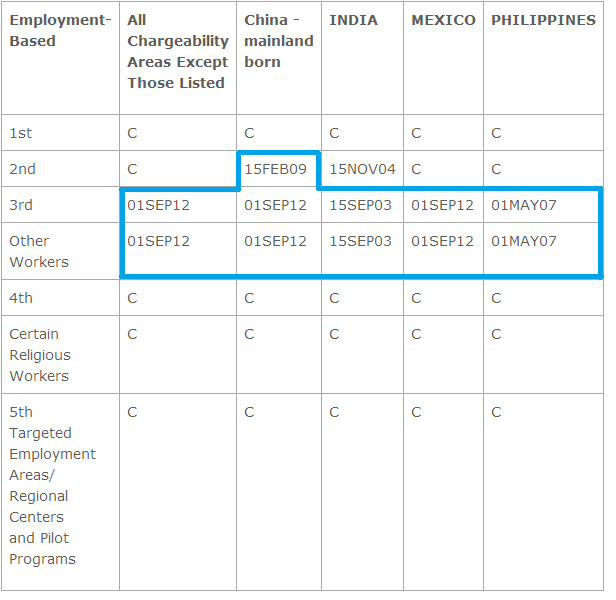 The long promised retrogression for F2A Mexico will happen in March, according to the Department of Labor’s newest update to the Visa Bulletin. Meanwhile, all EB3 regions will see advancement of cutoff dates, with China, Mexico, and “All Other” moving forward by 3 months. See below for a complete breakdown of the Visa Bulletin, plus forward guidance from the DOL. The big news for family-based categories is that F2A Mexico will retrogress significantly, from September 1, 2013 all the way back to April 15, 2012. This comes after F2B Mexico retrogressed 11 months in the February bulletin. Among non-current categories, only EB2 India failed to advance. EB3 and Other Workers advanced across the board, with China, Mexico, and “All Other” advancing a full 3 months. Continued heavy demand in the Mexico F2A category has resulted in the retrogression of this cut-off date to hold number use within the annual numerical limit. The above projections for the Family and Employment categories are for what is likely to happen during each of the next several months based on current applicant demand patterns. Readers should never assume that recent trends in cut-off date movements are guaranteed for the future, or that “corrective” action will not be required at some point in an effort to maintain number use within the applicable annual limits. The determination of the actual monthly cut-off dates is subject to fluctuations in applicant demand and a number of other variables. Unless indicated, those categories with a “Current” projection will remain so for the foreseeable future.